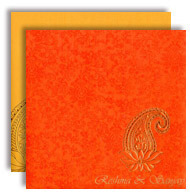 Description: Bright Orange metallic card has a light background texture with an artistic gold paisley design foiled towards the bottom right. Below the Paisley is the space to write bride and bride groom names as an option. Inserts are made of multicolor while the envelope is made of yellow metallic card.